The real identity of Jack the Ripper revealed at last? Only if the Hero of the Empire has his way! In an alternate nineteenth century where a technologically advanced Britain holds sway over most of the known world and the American Revolution never happened, young Gideon Smith is firmly established as the Hero of the Empire. Back in London, Gideon and his colleagues: journalist Aloysius Bent, airship pilot Rowena Fanshawe, and Maria, the mechanical girl to whom Gideon has lost his heart, are dragged into a case that is confounding the Metropolitan Police. For the city is on the edge of mass rioting due to the continuing reign of terror by the serial killer known only as Jack the Ripper, who is rampaging though London's less salubrious quarters. While chasing the madman, a villain from their past strips Gideon Smith of his memory and is cast adrift in the seedy underbelly of London, where life is tough and death lurks in every shadowy alley. With mob rule threatening to engulf London, the Empire has never needed its hero more...but where is Gideon Smith? 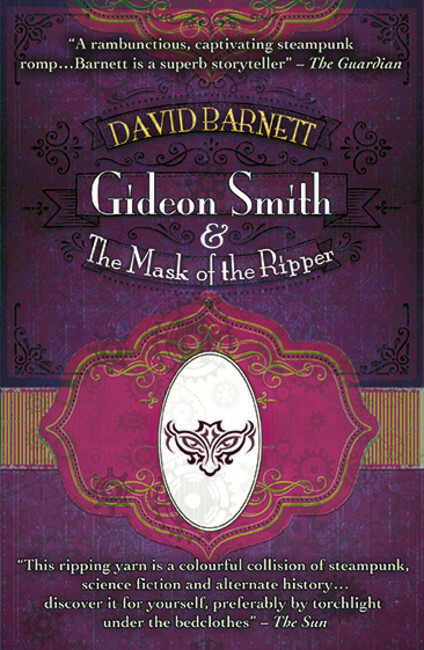 Gideon Smith and the Mask of the Ripper is the latest in David Barnett's riproaring steampunk adventures about a Britain that never was...but should have been.